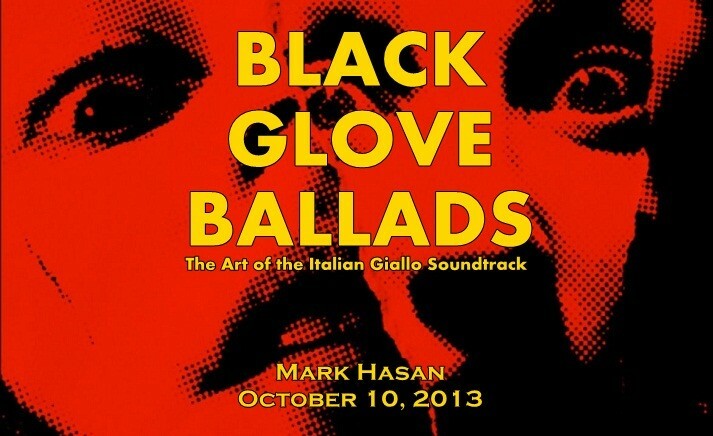 Black Glove Ballads: The Art of the Italian Giallo Soundtrack 3.0: Bonus Content! Big thanks to the kind film / giallo / film music fans who came down to the Big Picture Cinema and attended my lecture on the film music of giallo films. Hopefully things were presented in a way that worked for everyone, with thoughts and facts ably supporting the film and music clips covering the nature of the giallo; its roots; chief pioneers Mario Bava and Dario Argento; and stellar composers Carlo Rustichelli, Stelvio Cipriani, Bruno Maderna, Ennio Morricone, and Goblin. I think the evening’s total running time (with intro & intermission) was about 2.5 hours, so naturally there were a few things that were cut to make sure the lecture didn’t each the 3 hour mark. 1 — “Silent and Early Sound suspense film comparison.” I cut this prior to the lecture because it may have been easier with words. Maybe. Still feel this montage showed the humour between scored silent films; what was lost when dialogue and bad sound took over in early, hastily made quickies; and what was achieved under the dominance of a creative director. The montage includes The Cat and the Canary [M] (1927), The Phantom [M] (1931), and The Old Dark House [M] (1932). 2 — “Stelvio Cipriani’s ‘Bay of Blood’ score – Main Titles comparison.” I boo-booed in not transferring files from the editing machine to the netbook, so here are the two music cues which clearly influenced Cipriani ‘s writing of the main titles for Mario Bava’s Bay of Blood (1971). I’m off to catch Goblin at The Opera House tonight, so this post is a bit brief, although expect a review of the Danish crime series Those Who Kill / Dem som draber (2010) shortly, including the feature film which wrapped up the series. Sunday will see several of the reviews currently on pause mode finally uploaded, including that podcast with World War Z’s Marco Beltrami. That’ll be followed by another nostalgia piece in salute to International Independent Video Store Day, with scans of more ephemera. Lastly, thanks to Joe, Mark II and James for coming to the lecture, Christina and Caroline for covering shifts, Andrea and Paul for such a great opportunity to test research material for a book on Argento’s use of music that’s been on the back-burner for too long. Thanks as well to Tina, Margaret, Dwayne, Mike (MJD), and Colleen for large & small nuggets of advice on tackling a lecture.